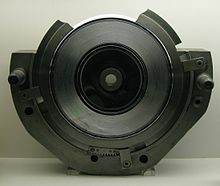 Cutaway shot of one side of a 7" record mould with stamper fitted. A record press is a machine for manufacturing vinyl records. It is essentially a hydraulic press fitted with thin nickel stampers which are negative impressions of a master disc. Labels and a pre-heated vinyl patty (or "biscuit") are placed in a heated mold cavity. Two stampers are used, one for each of side of the disc. The record press closes under a pressure of about 150 tons. The process of compression molding forces the hot vinyl to fill the grooves in the stampers, and take the form of the finished record. In the mid-1960s, Emory Cook developed a system of record forming wherein the mold pressure was replaced by a vacuum. In this technique, the mold cavity was evacuated and vinyl was introduced in micro-particle form. The particles were then flash-fused instantaneously at a high temperature forming a coherent solid. Cook called this disc manufacturing technology "microfusion". A small pressing plant in Hollywood also employed a similar system which they maintained fused the particles more evenly throughout the disc thickness calling their product "polymax". Both claimed the resultant disc grooves exhibited less surface noise and greater resistance to deformation from stylus tip inertia than convention pressure molded vinyl discs. ^ Riordan, James (1991). Making it in the new music business (2 ed.). Writer's Digest Books. p. 233. ISBN 0898794587. ^ White, Glenn; Louie, Gary J. (2005). The Audio Dictionary. University of Washington Press. p. 271. ISBN 0295801700. Wikimedia Commons has media related to Record press. This page was last edited on 26 March 2018, at 14:48 (UTC).